Today's Prize: Two tasting coupons good for a flight (2 wines paired with locally made spread and crackers) or $9 off a glass of wine (winner's choice!) + two Leelanau Peninsula flutes and a MAWBY stopper. (Click here and here for pics of the prizes.) 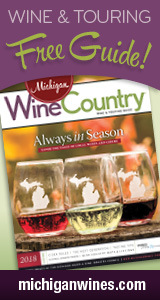 Must pick up at their Leelanau Peninsula tasting room.